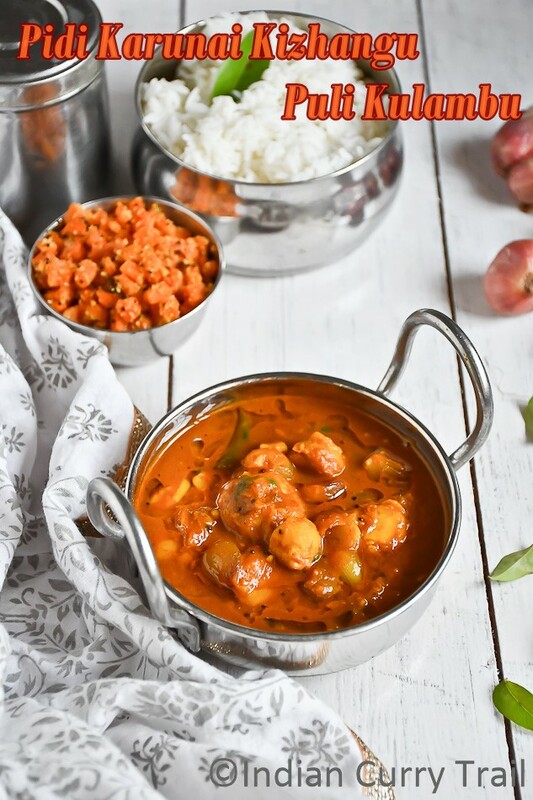 Pidi Karunai Puli Kulambu is one of the best southindian gravies that is been prepared using the pidi karunai(Tamil) or wild yam(English) or dan kaanda(Hindi). Generally, a week old pidi karunai would be selected for this gravy to reduce the itchiness of this kizhangu. In some places of Tamil Nadu, it would be prepared in the previous night itself, to serve it in the next day to avoid the itchiness. 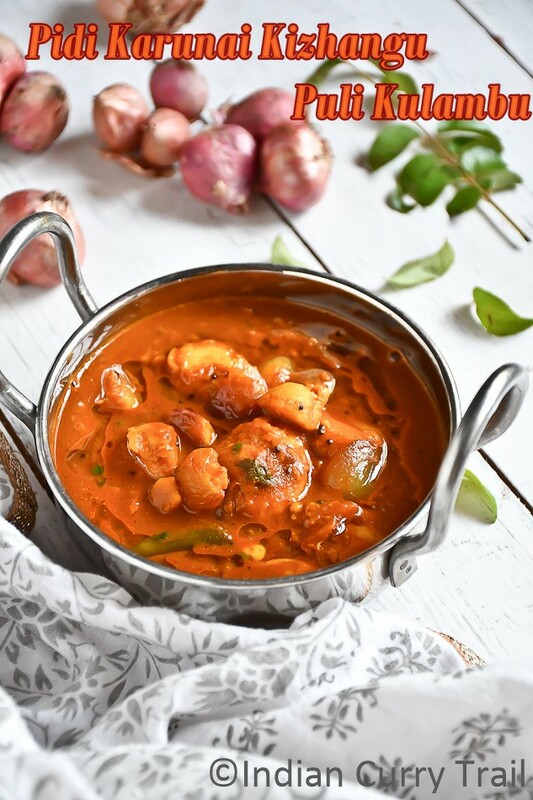 This pidi karunai tastes good with tamarind based gravies and it can also be prepared without tamarind. Today we will see the gravy using tamarind. 1. Wash and Pressure cook the Pidi Karunai Kizhangu for 3 whistles. Once cooked, peel the skin and slice into thick ones. If the pidi karunai kizhangu is soft, make thick slices, otherwise make thin ones. 2. Soak tamarind in a 2 and ½ cup warm water and extract the juice. 4. Add mustard seeds, fenugreek seeds, asafoetida and curry leaves. Let them splutter. 5. Add onion and garlic. Saute till onion becomes soft. 6. Add tomato. Continue sauteing till it becomes mushy. 7. Add turmeric powder, kuzhambu milagai powder and salt. Mix well without burning. 8. Add tamarind water and mix well. Let it roll boil. 9. Add the pidi karunai kizhangu slices and mash one or two slices using ladle. 10. Let the gravy comes to the desired consistency. Once it is reached the desired consistency, add a teaspoon of gingelly oil and turn off the stove. 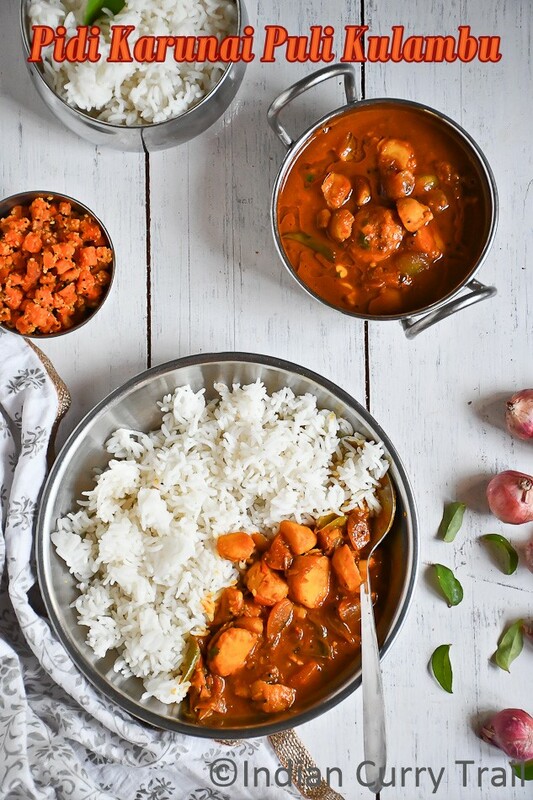 This pidi karunai puli kulambu is generally served with steamed rice or plain rice. It also goes well with Millets, dosa and Chapathi. 1. Choose the pidi karunai kulambu that are one or two week(s) old to avoid the itchiness. 2. If you got only fresh ones, then make the gravy in the previous night itself, to serve next day to avoid itchiness. 3. Instead of kulambu milgai powder, you can substitute sambar masala.